Admire the natural pairing of traditional and contemporary design in the new Television Bench from the Westlake Collection by Sonax. This timeless piece is featured in our warm Mocha Black stained wood veneer and accented with tempered glass cabinet doors with horizontal wood trim. Offering a variety of open and concealed storage options this prominent bench is perfect for all of your A/V components and accessories and can accommodate most TVs up to 68. Good things come in small packages. The small Madison Storage Ottoman brings soft, modern style to any interior. Perfect for storing extra blankets, remotes or even extra throw pillows, it also adds the ever-elusive extra seating at your next soiree. Refresh your home with this engaging combination of modern design and efficient storage space from the Bromley Collection. This contemporary TV Bench features a variety of storage solutions; dual storage drawers, open storage shelves and discrete side shelves ideal for CDs, DVDs and books. Organization never looked so good. 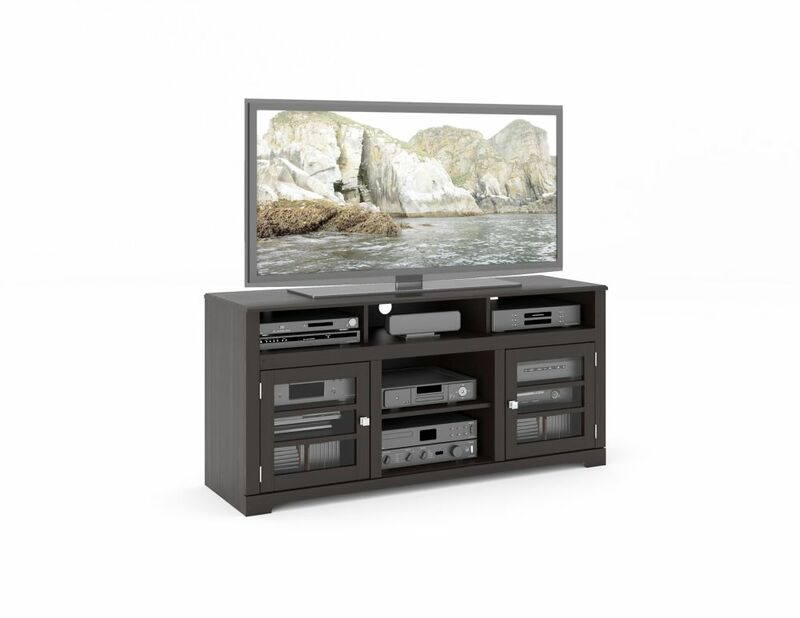 Complete in our signature Ravenwood Black finish and designed to accommodate most TVs up to 70, this contemporary Sonax furniture is proudly made in North America. B-602-BWT West Lake 60" Television Bench in Mocha Black Admire the natural pairing of traditional and contemporary design in the new Television Bench from the Westlake Collection by Sonax. This timeless piece is featured in our warm Mocha Black stained wood veneer and accented with tempered glass cabinet doors with horizontal wood trim. Offering a variety of open and concealed storage options this prominent bench is perfect for all of your A/V components and accessories and can accommodate most TVs up to 68. B-602-BWT West Lake 60" Television Bench in Mocha Black is rated 5.0 out of 5 by 1.